Permission has been given for exploratory drilling for oil and gas in the Vale of Glamorgan. Plans were approved for Coastal Oil and Gas Limited to drill in a field at St Nicholas. The permit does not allow the company to carry out fracking - hydraulic fracturing of the land - to extract any oil or gas. 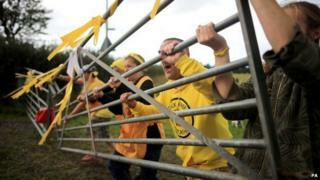 Fracking is subject to a temporary ban in Wales until decision-making powers on the practice are devolved. Natural Resources Wales said it had carried out a "thorough assessment" of the company's plans before approving them, with all work including reinstatement of the land to be completed within 12 months. "It's important that any activity of this kind doesn't harm the environment, and this permit makes it clear what Coastal Oil and Gas Limited will need to do to comply with this," a spokesman said. "Once the work begins, our officers will regulate and monitor the site to ensure it complies with the conditions of the permit, to protect people and the environment." The permit for exploratory drilling comes despite a moratorium on fracking in Wales pending devolution of responsibility for such decisions. In August, the UK government urged councils in England to speed up the process of approval for fracking projects. However, Natural Resources Minister Carl Sargeant said fracking technology was "unproven", and that Welsh Labour ministers preferred to look at renewable energy.